A free-standing Audio-Recording application with the same functionalities as the integrated application is also part of the program. This feature is available in most windows of the program. Its particular purpose under the Tools pull-down menu is to provide menu control for the Sound Recording floating window. 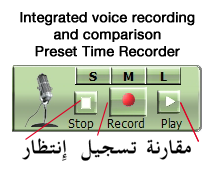 The timer should be set for the estimated recording time for words, sentences, or to record a full page. The purpose of limiting the recording time is needed to support the reading flow, and to limit a possible hazard of a young student inadvertently leaving the recorder running, and thus satiating the Hard Drive with a large size audio file that can consume the HD free space and block the system memory. Easy to use integrated audio recording and comparison tool. Select a word or a sentence from the Arabic text in a lesson. Click the Record button once. begin recording following the prompt. Listen to your recorded voice and compare it to the original. Click the Play button to listen again.